histories re-inscribe our internal and external world. Our actions in any social space are to a certain extent guided and shaped by theses scripts; Sometimes, to such extent that we reproduce our ancestral past without any conscious awareness. This work researches through collecting, archiving, re-creating textiles and performing the story of Liraz´s grandmother, her mother, her grandmother and her great grandmother and through that shapes a Jewish identity which is independent from the colonial idea and previous to the Shoah, and rooted in the rich past of the Jewish community in Ioannina, Greece. Through a four-chapter performance, Liraz re-creates a process of embodying history/ies and being alive as shaped and shifted by the colonial gaze of German and Israeli nationalisms. 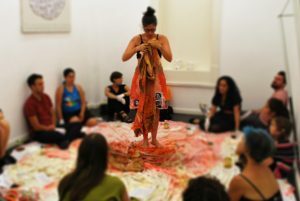 She explores the inscribed past of previous generations of her family in her own body of existence, marking the connection between the personal and the collective. By creating an organic space made out of those experiences, Liraz produces new channels to share those collectively. The interactive performance aims to create a temporarily set counter-public and a sense of solidarity. The event will be followed by a Q&A moderated by Mai Zeidani Yufanyi . Mai Zeidani Yufanyi is a social scientist and activist. Her work explores postcolonial migration societies in Europe and the processes of identity-making in Palestine and Israel. She is a project officer with Insaan e.V., the co-host of Reboot.fm’s radio show, Talking Feminisms and an activist with the Caravan of Migrants and Refugees.